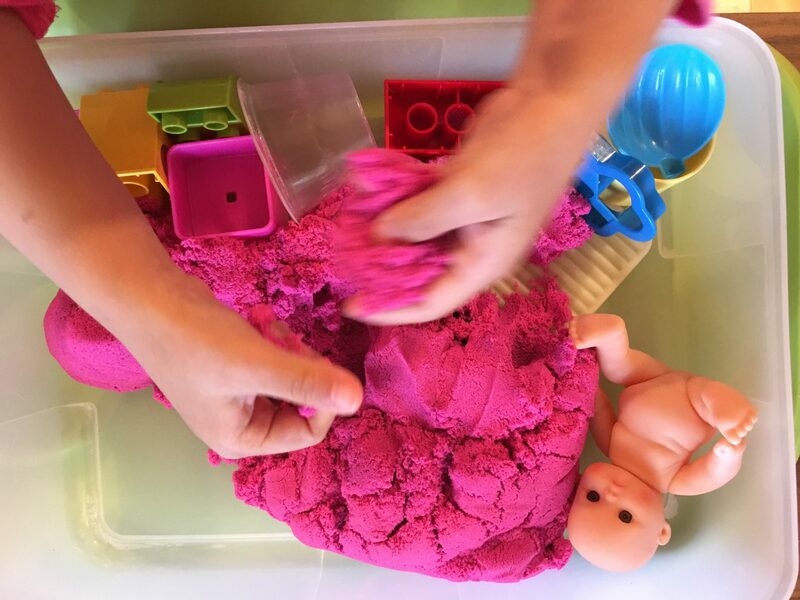 Kinetic Sand and CoolSand are two kinds of sensory kids play sand. If you are wondering which kind to get, check out our reviews below! Kinetic Sand - 5 out of 5 elephants! This is the play sand you want! It’s way less messy and actually flows in a “kinetic” manner. It’s a super cool sensory toy! CoolSand - 4 out of 5 elephants! This sand is drier and messier. My kid, however, didn’t seem to mind the grittier texture. A good choice if you are looking to purchase large amounts of play sand without breaking the bank. What is Sensory Kids Play Sand? Both Kinetic Sand and CoolSand are moldable play sand that sticks together like play dough. 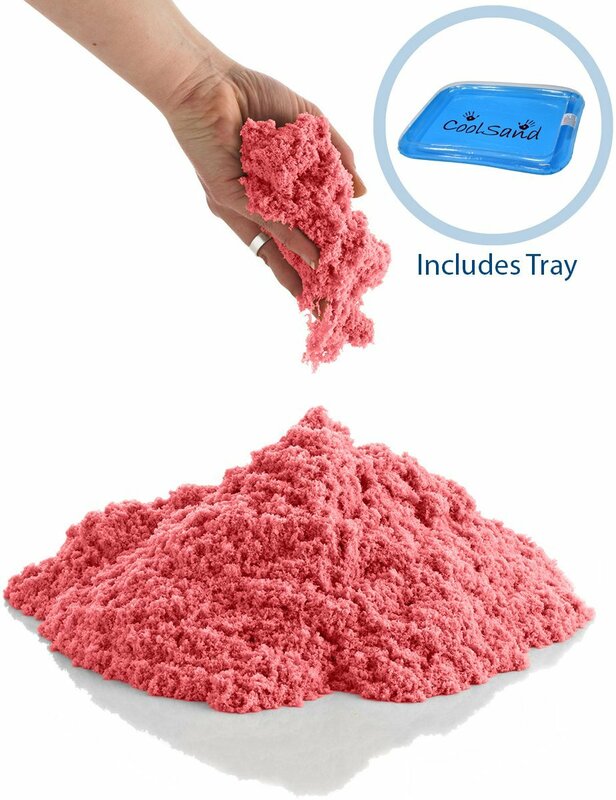 Both Kinetic Sand and CoolSand never dry out, and can be played with over and over again. Both brands make sand that comes in an array of bright colors, as well as the standard beach sand brown. Why Play With Sensory Kids Play Sand? 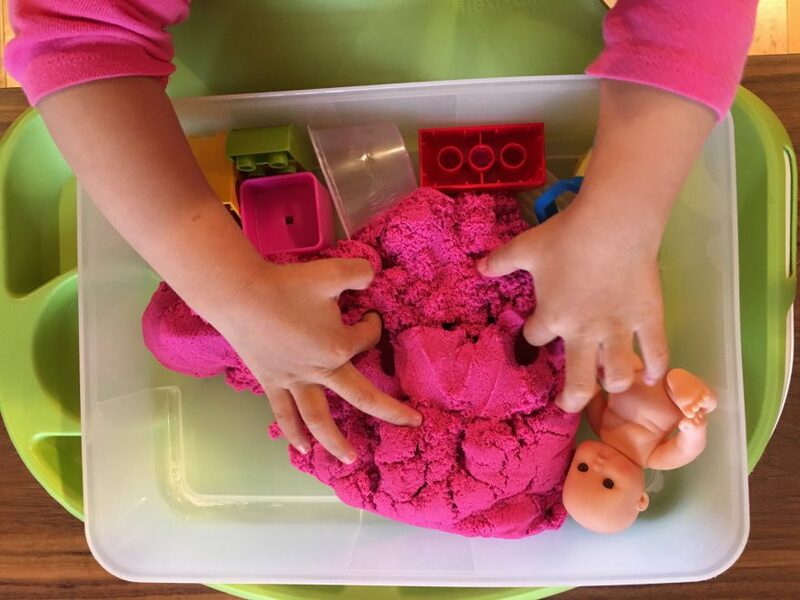 Play sand like Kinetic Sand and CoolSand are awesome sensory toys for children. Like other sensory activities, playing with sand will help your child develop important motor and language skills, and stimulate all of their senses. Play sand is also beneficial for kids with special needs. Note: I’m not compensated in any way for these reviews. This is simply the 100% unbiased opinion of a mom who’s tried these two types of play sand. I was a lot more impressed with Kinetic Sand. This sand actually moves in a completely magical way! The grains stuck together really well like they were magnetically attracted to each other. I was mesmerized by the way the sand poured: it actually moved like a viscous liquid! Cleanup was incredibly easy. Just use a ball of sand to pick up smaller bits of sand, similar to cleaning up play dough. My husband was super into this sand as well. He even brought some to work to play with! He claims it’s excellent for problem-solving and relieving stress! CoolSand is another brand of moldable play sand that can be purchased on Amazon. I’d purchased 5 lbs of CoolSand because of the glowing reviews on Amazon. It is also slightly cheaper than Kinetic Sand. My first impression of CoolSand was that it seems drier and grittier, and wasn’t as sticky as what I’d expected. The texture reminded me of brown sugar that had clumped together. Cleanup was more tedious as the sand didn’t stick together and I had to use a wet cloth to pick up the grains. My 5lbs of CoolSand also comes with a small inflatable container that I thought would make a great little indoor sand pit. Unfortunately, the container was too shallow and caused the play sand to spill everywhere. Most disappointingly, CoolSand did not move or flow in a magical “kinetic” way. It moved more like wet compressed beach sand. It was however, vibrantly-colored and my kid was able to play with it like play dough. She was also able to use her play dough tools to mold and shape the sand into many fun shapes and objects. How Much Sand Do You Need? If you are new to play sand, I’d suggest buying about 1-2lbs first to see if you child enjoys playing with it. 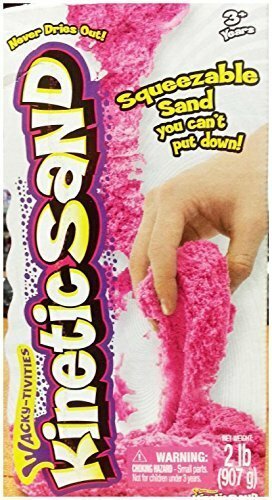 I’d ordered 2lbs of Kinetic Sand and was worried that it wouldn’t be enough for my toddler to play with. Well it turned out I was wrong: 2lbs was completely adequate and enough to keep her occupied for over an hour! I recommend storing play sand in a large plastic box, this way your kid can leave their sand play tools in there as well. It should be kept away from pets in case it is accidentally ingested. Totally! I would definitely buy Kinetic Sand again! It would make a great educational gift for kids. It would also make a quirky, stress-relief toy for adults. Add some small rakes and rock, and it’ll make a kickass desk-sized Zen garden as well!